South Dakota Facts | Cool Kid Facts . South Dakota is a midwestern state with one of the smallest populations in the nation. Although much of the state is occupied by plains, it’s also home to the Black Hills National Forest, which is the site of Mount Rushmore. Visitors to South Dakota can explore Native American culture, the Old West, deep underground caves, and prairie ecosystems. There may not be a lot of people in South Dakota, but the state still offers plenty of unique attractions! Lowest point: Big Stone Lake at 966 ft. Highest point: Harney Peak at 7,242 ft.
South Dakota is home to some interesting attractions. 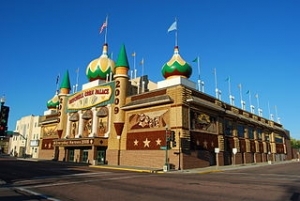 In Mitchell, South Dakota, you can visit the world’s only Corn Palace. It’s made of over 3500 bushels of corn. Clark, South Dakota hosts the famous mashed potato wrestling contest. The most popular tourist attraction in South Dakota is Mount Rushmore, which has the faces of George Washington, Abraham Lincoln, Thomas Jefferson, and Theodore Roosevelt sculpted into its surface. Sculptor Gutzon Borglum started drilling into the 6,200-foot Mount Rushmore in 1927. The project took fourteen years and one million dollars to complete. 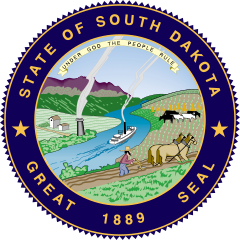 South Dakota has one of the largest American Indian populations at around 60,000 people and nine tribes. It’s the home of the Dakota, Lakota, and Nakota tribes, which form the Sioux Nation. The Mammoth Site of Hot Springs in South Dakota contains the largest collection of Columbian mammoth and Woolly mammoth bones ever discovered. To this day, the bones haven’t been touched or moved at all. It’s the only display of fossils in the world that has been left exactly how it was found. There are two sculptures carved into the Black Hills: Mount Rushmore and the Crazy Horse Memorial. Crazy Horse was a Sioux Indian chief, and his sculpture is the world’s largest at 563 feet high and 641 feet long. It’s part of an educational and cultural memorial focused on the American Indian. The black footed ferret, the most endangered land mammal in North America, has been reintroduced in South Dakota’s Sage Creek Wilderness.